Some people overcome their mid-career blues by splurging on a fire-engine red sports car. Others move to Mexico or Australia. For Dale Plummer, the solution was to go back to the water. He quit his job selling automation systems for high-rise buildings and became a towboat captain on the Chesapeake Bay. It’s kept him buoyed ever since. Luckily for Plummer, his wife, Christine, also was at a pivot point. Armed with a new degree in mass communications, she got a job in public relations, keeping the family afloat while Dale earned his captain’s license and worked for a small independent towing firm. A few years later, the owner retired. Dale took over the company. 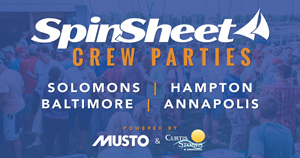 Plummer runs the TowBoatUS operation for the northern part of the Bay, under license from the BoatUS subsidiary. 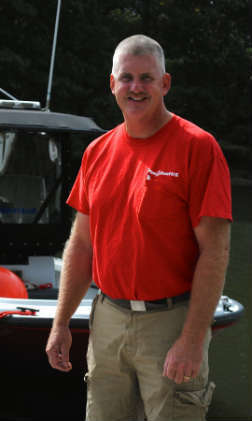 He oversees a towboat flotilla comprising two 24-foot rigid inflatables, a 24-foot Boston Whaler, a 27-foot twin-screw SeaArk, and a 32-foot jet-boat — all painted in the familiar easy-to-spot red, with oversized white logos. Plummer’s day begins at 8 a.m., when he looks over his boats to make sure they’re ready to go. At 10 a.m., he telephones his part-time captains to check on when they’ll be available and to coordinate the watch bill. The rest of the morning goes to managing the company’s response to towing calls and to maintenance and repairs on the idle boats. Plummer is on call 24 hours a day. Actually, TowBoatUS acquired two Plummers in the licensing arrangement. While Dale oversees his company’s complement of part-time captains and takes care of boat-maintenance and repair, Christine handles telephone calls and VHF-FM radio communications, keeps the books, and manages the business. As both of them will attest, operating a towboat service is a demanding business. In summer, the Plummers are working overtime on weekends — during the days and late into the evening — and the hours are long on weekdays and holidays as well. Dale takes the nighttime tow runs himself. When the weather is bad, there’s little time to sleep. In the spring, Plummer also serves as guest speaker at evening meetings of fishing groups, yacht clubs, trawler associations, and powerboat clubs. As the Plummers attest, a towboat captain’s time on the water ranges from demanding to occasionally harrowing, with a share of frustrating moments. For instance, earlier this year, Plummer responded to a call from a boat near Key Bridge, but couldn’t find the vessel or raise its owner, either on the radio or by cellphone. With the seas picking up, Plummer searched into evening, finally spotting a bow light. The boat had been overturned by a wave, and its crew was hanging onto the hull. A year ago, the skipper of a 38-foot powerboat gave Dale Plummer three widely differing GPS coordinates, all of which proved to be incorrect, forcing Plummer to spend several hours searching for the vessel. The skipper had misread the GPS receiver, giving Plummer the coordinates for his waypoints and destination instead of his current position. Although most towing calls involve mundane problems, such as a boat running out of gas or a failed mechanical part, towboat companies also respond to distress calls in which boats are taking on water, sinking, or on fire. They often handle Coast Guard requests for help when the service is busy or the towboats are closer to the troubled boat. Plummer is continually surprised at how often recreational boaters go out on the water unprepared, without the seamanship skills they need to operate their vessels, without taking account of impending bad weather, and without recognizing the limits of their own boating abilities. Plummer sees an irony in this. “Many times when the Coast Guard is telling everyone else to come in, I’m the one who’s going out — on a rescue call,” Plummer says. Even as the owner of a towboat company, Plummer says he still doesn’t get enough time on the water. In his 20s and 30s, he did a lot of scuba-diving, raced jet-skis, and hunted and fished. Now he has to find time for such things during his winter vacation, usually in the Caribbean.